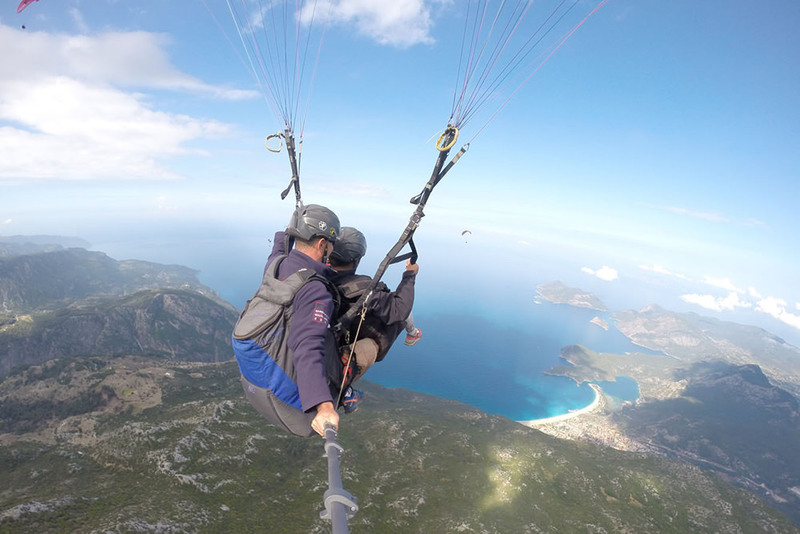 Babadag (Father Mountain) towering above Oludeniz on the Southwest coast of Turkey is a geological marvel that just happens to make for incredible thermals and ideal conditions for paragliding flight. 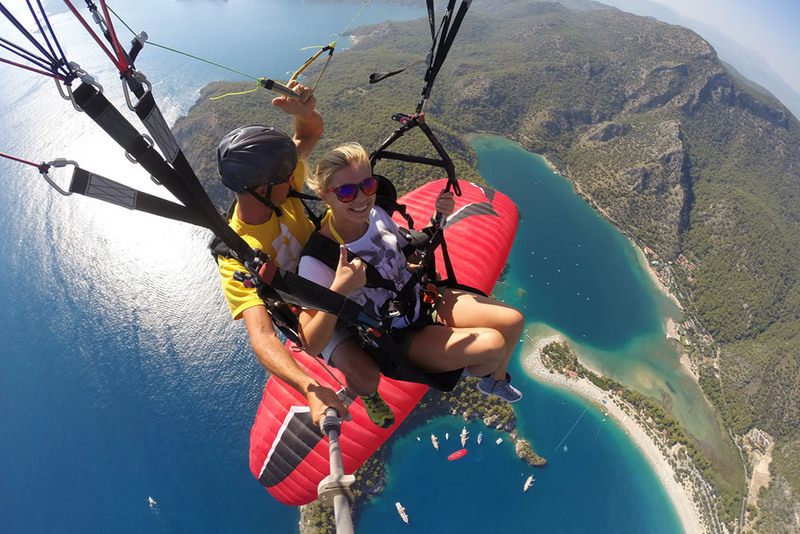 Oludeniz is reputedly the best site in Europe, if not the world, to fly pargliders cross-country in both solo and tandem modes. 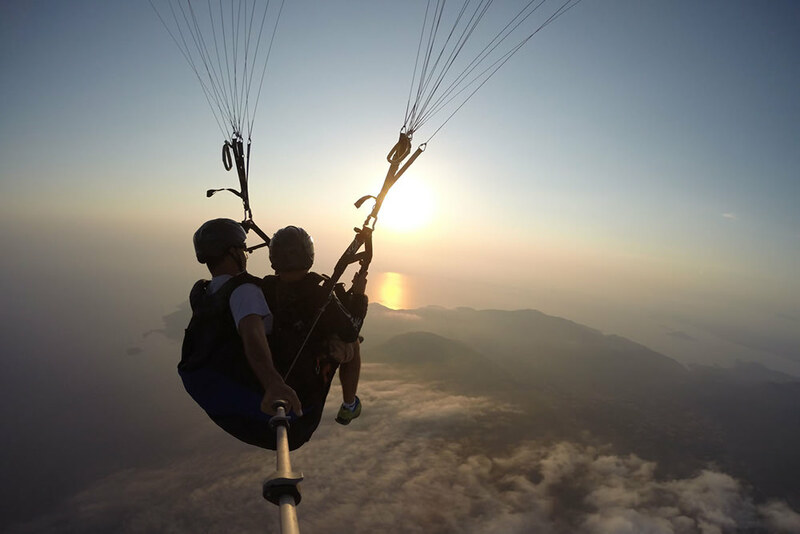 We offer you the tandem paragliding experience of a lifetime, for many people a dream come true. 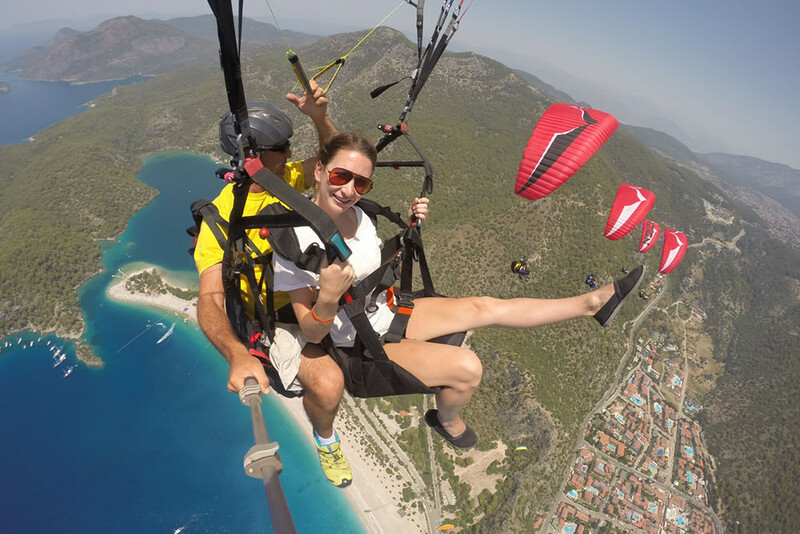 Picture yourself, comfortably seated, gracefully gliding above the scenic mountainside and lagoon, feeling the light breeze on your face whilst you and your pilot soar high over Oludeniz beach packed with hot and sweaty sunbathers! 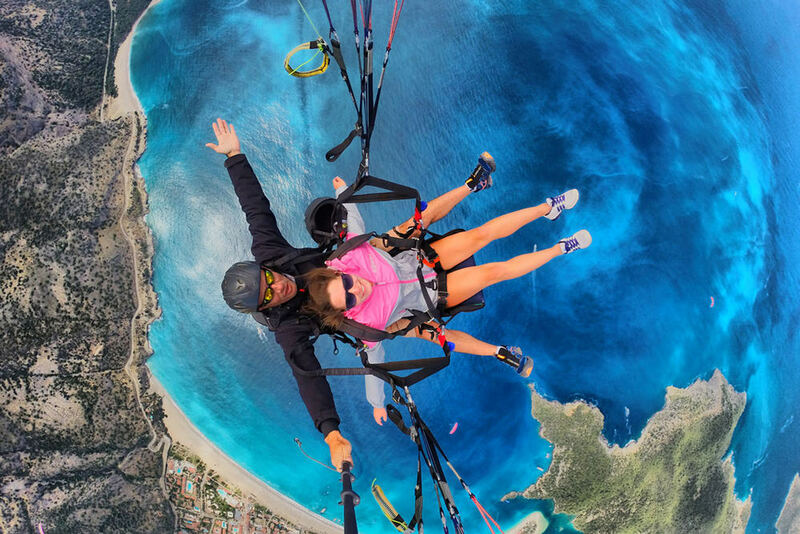 This rare opportunity to take off from such a fantastic backdrop as Babadag, offering the breathtaking view over Oludeniz lagoon, a spectacle in itself, coupled with the opportunity to fly tandem for up to 45 minutes, virtually unheard of in any other location in the world, all adds up to ensuring the trip of a lifetime, and one not to be missed. Your journey to the take off point is an experience in itself. From Oludeniz beach, a 50 minute 'jeep safari' gives you the unrivalled opportunity to take in the extraordinarily beautiful Turkish mountainside scenery and the stunning flora and fauna it has to offer. We fly four times a day, every day from April to November. In brief, your pilot will launch you from a hillside under a canopy that resembles a parachute but acts like a rigid wing. Once inflated overhead, you will take just a few steps, or a short run to take off from the gentle slope, the wind will catch the canopy and you will be airborne. Once in the air, complete control over direction and speed gives your pilot the freedom to soar ridges, rise on warm currents of air and cover distances. At Skysports we have a proven safety record from day one which we credit to our staff, professionally maintained and certified equipment and company procedures. Our professional pilots fly four times a day, every day, taking people like you; male, female, young and old on this amazing adventure. Each passenger is briefed and issued with a helmet and a flying suit and all pilots carry complete reserve and communication systems. Furthermore, weather conditions are carefully assessed before we take you to the sky. Bookings are essential, so don't leave it until your last day as we are dependent on the weather conditions. What is the minimum - maximum age to fly? 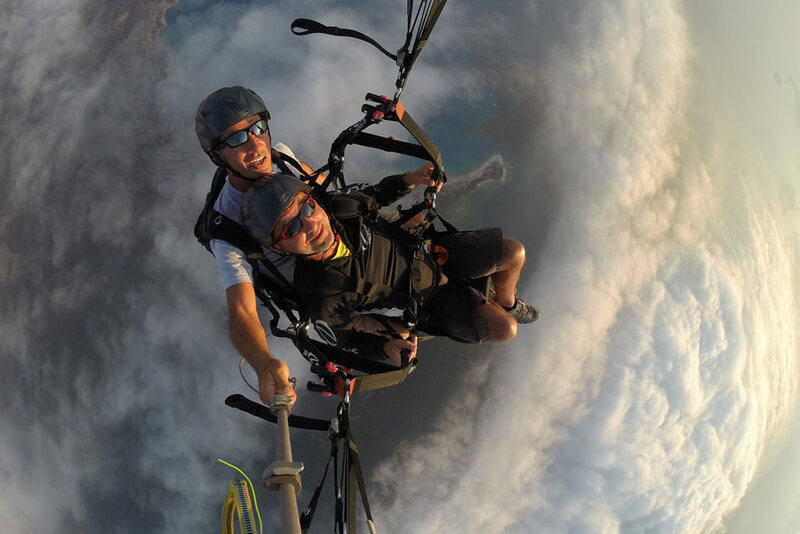 Almost anybody can partake in paragliding and at Skysports we have flown passengers from 4 to 84 years old! Our season begins the third week of April and finishes the first week of November. A tandemflight costs GBP 70. Am I insured to fly through paragliding company? Yes, our fully comprehensive insurance policy covers you for up to GBP 1 million. Is there a weight restriction to fly? As each canopy has a limit on how many kilos it can carry, our pilots are carefully matched to each passenger according to their combined weight and the weather conditions. At Skysports we currently enforce a weight limit of 110kg (17stone) per passenger however this can vary according to the passenger's level of fitness. How long will I be in the air? Skysports provide a flying suit for each passenger so all you need is some comfortable clothing and a sturdy pair of shoes (ie trainers). Sunglasses, a bottle of water and don't forget your camera! Do I need any training or experience to fly? Absolutely not. No experience is required to fly as you will be fully briefed prior to take off. You will merely run a few steps and the rest is in the hands of your fully qualified pilot. Just sit back and enjoy your flight! How do we arrive at the 2000m take off point? Your journey to the take off is an experience in itself. From Oludeniz beach, a 50 minute 'jeep safari' gives you the unrivalled opportunity to take in the extraordinarily beautiful Turkish mountainside scenery and the stunning flora and fauna it has to offer. 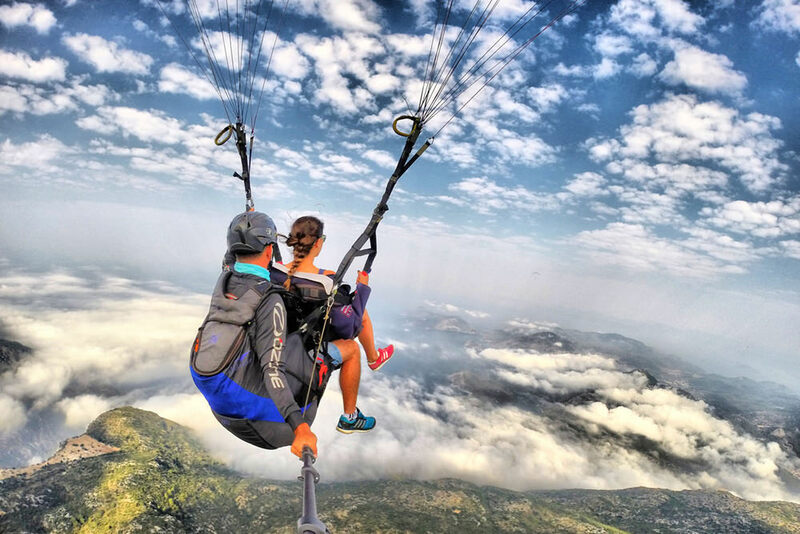 Can I pre-book my tandem paragliding flight? Bookings are essential, so don't leave it until your last day as we are dependent on the weather conditions. Yes, in fact we recommend doing so. Each flight is weather dependent and flight times can get booked up very quickly.